A longtime sideman of Zydeco King Clifton Chenier and later C.J. 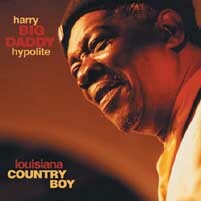 Chenier, Harry Big Daddy Hypolite steps into the spotlight for the first time with Louisiana Country Boy, his solo debut. If you share the tastes of APO Records' CEO Chad Kassem, you'll wonder, after hearing this recording, how this soulful voice and natural charisma have gone relatively unnoticed for so long. Deep down in rural Louisiana, Hypolite, a self-confessed poor boy, has been honing his blues since he could talk - first in Creole French and then in English (both languages are represented on this release). The results are heartfelt confessions of real-life hard times. "Nobody gave me a chance before," Hypolite said. "But I said, 'I'm going to show 'em what I can do.' For me, this comes from deep in my soul. I want to play the blues, and I want to tell people about my Creole French heritage." These are deep, unpolished, gravely blues. In short, this is the real stuff - the blues of undiluted emotion. Louisiana Country Boy is also full of zydeco - a genre Hypolite said is not always played the way masters like Clifton Chenier intended it to be. "Zydeco is simple music," he said. "Guys who try to play jazz and put big chords in zydeco make it hard on themselves. You just need to know how to phrase it right, and it has to have a feeling and a meaning to it." Feeling and meaning - those are attributes Big Daddy is never short on. Even in the simplest of conversations, Hypolite wears his heart on his sleeve. If he doesn't win you over with his smile, he'll floor you with his laugh. Hypolite has bottled pure emotion by writing and singing autobiographical songs that reach all the way back to his childhood. He's been waiting for this moment for so long, played it over in his head so many times, that almost every song on this recording was done in one take, with no lyric sheets. In accordance with an APO Records tradition, the small mistakes were overlooked if the feeling captured could not be reproduced. At a time when many authentic blues artists are in the twilight of their careers, it's the dawn of Harry Hypolite's time in the sun. "This is like a dream for me," he said. "I'm proud of this record." "His open and syncopated acoustic and electric guitar licks are as steamy and brooding as the Louisiana swamps that serve as an ever present back drop to those rich and fulsome vocals which so memorably capture an essence of poverty, hard luck and heartache."